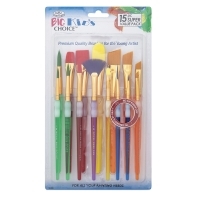 Intended for young artists' hands, Royal Langnickel Big Kids' Choice Lil' Grippers brushes have thicker handles and a rubber Soft Grip for easy handling. The synthetic brush hair has been dyed to match the handles — kids will love the bright colors! Available in specially selected sets, Lil' Grippers are great for use with acrylics, tempera paints, watercolors, and more. 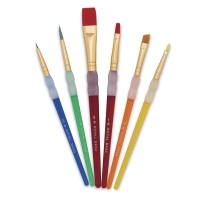 Deluxe Assorted, Set of 6 — This deluxe set includes six short-handled brushes: Flat 5/8", Flat 6, Detail 10/0, Angular 1/4", Round 4, and Filbert 2. Deluxe Angular, Set of 5 — This set contains five short handled brushes: Angle 1/8, 1/4, 3/8, 1/2, and 5/8. Fan Variety, Set of 5 — This set contains five short handled brushes: Angle 3/8, Fan 8, Filbert 8, and Round 1 and 2. Flat Variety, Set of 5 — This set contains five short handled brushes: Angle 3/8, Filbert 6, Flat 3/4, Round 1 and 4. Filbert, Set of 5 — This set contains five short handled brushes: Filbert 2, 4, 8, 10, and 12. Fan, Set of 4 — This set contains four short handled brushes: Fan 2, 4, 6, and 8. Filbert/Angular, Set of 4 — This set contains four short handled brushes: Filbert 8 and 3/4, and Angle 3/8 and 3/4. Round/Flat, Set of 4 — This set contains four short handled brushes: Flat 1/2 and 3/4, and Round 10 and 20. Beginner, Set of 4 — This set contains four short handled brushes: Flat 4 and 8, Round 1, and Angle 1/4. Pouncer, Set of 4 — This set contains four short handled brushes: Pouncer 1, 2, 5, and 8. Deluxe Round, Set of 6 — This set contains six short handled brushes: Round 10/0, 2, 4, 6, 8, and 10. Deluxe Shader, Set of 6 — This set contains six short handled brushes: Shader 2, 4, 6, 8 , 10, and 5/8. Chubby Round/Flat, Set of 5 — This set natural bristle set contains five short handled brushes: Flat 1, 6, and 12, and Round 2 and 10. Variety, Set of 15 — This 15-brush pack includes three Flat brushes (Sizes 3/4", 5/8", and 8), three Angular brushes (Sizes 3/4", 5/8", 3/8", and 1/4"), three Round brushes (Sizes 10, 6, and 4), two Filbert brushes (Sizes 3/4" and 4), a Size 1 Liner brush, a Size 1 Script Liner brush, and a Size 6 Fan brush. ® Royal & Langnickel is a registered trademark.™ Kids' Choice is a trademark. ™ Lil' Grippers is a trademark.